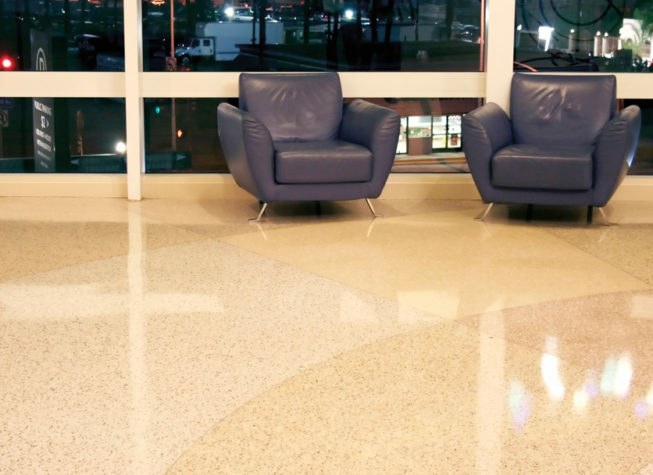 It is often the practice to coat or wax terrazzo to achieve a polished look, but these coatings have a tendency to yellow and collect dirt and must be repeatedly stripped and reapplied. However, we find this coating process to be not only time-consuming and costly, but also unnecessary. Terrazzo is a unique surface, primarily found as flooring, that traditionally contains marble chips of different sizes and colors held together with a cement base or, in newer applications, with a resin or epoxy base. Aggregates other than marble may also be used. Using the same process used to restore marble and other natural stone, terrazzo can be honed and polished to achieve both glossy and matte finishes without the need for coatings. This same process masterfully restores scratched and worn terrazzo to like-new (or better) condition, as well. At Godoy Stoneworks and Tile Care, we can instruct you on the proper day-to-day care of your terrazzo. We offer a free, downloadable Care Guide and can recommend Care Products safe for terrazzo to help you keep your home or business looking great. We also provide a regularly scheduled maintenance program, upon request. For a FREE estimate on terrazzo stripping, cleaning, repair, honing and polishing or other terrazzo restoration services in Broward, Palm Beach, Martin, and Indian River Counties, fill out our online contact form or call (561) 502-0692 or (561) 797-9592 today.